A six-seat Cessna 206 H float plane takes off from Ashtamudi Lake in Kollam district in Kerala onÂ June 1. Its destination: Punnamada Lake in neighbouring Alappuzha district. It was the inaugural flight of the famed ‘Seaplane’ project of the state government. On board was the state tourism minister AP Anilkumar and the central minister of state, KC Venugopal. But the seaplane returns within five minutes. Reason: The ‘water drome’ at Punnamada, where the plane was to land, was blockaded by fisher-folk in country boats. The seaplane project envisaged to boost tourism was first mooted at ‘Emerging Kerala’ - a global investors’ meet held at Kochi in October 2012 for encouraging and facilitating capital investments in the state. Several projects were formalized and many MOUs were signed. The seaplane project was the first to be implemented. Ironically, the investment for this project was not made by any ‘global investor’ but by the state government itself. Rs 15 crore have been allotted and Rs 5 crore already spent on infrastructural facilities at Kumarakom, Vembanad, Ashtamudy and Bakel, all tourist spots. All that the present operator, Bangalore-based Kairali Aviation, had to do was to take on lease an amphibian craft from Dubai. The project basically aims to link tourist destinations in Kerala by amphibian aircrafts. 22 such destinations have been identified and five operators shortlisted. The state owned Kerala Tourism Infrastructure Ltd (KTIL) is the nodal agency for the project. Environmental Impact Assessment (EIA) had not been done for the project despite Ramsar sites being involved. The project report for the seaplane operations was prepared by Pawan Hans Helicopters Ltd, and they have merely reproduced portions pertaining to environment and pollution from a study done in the USA. “We will not allow this project to take off, as it seriously affects the livelihood of the local fisherfolk” says TJ Anjelos, the president of the Matsya Thozhilali Federation and AITUC leader. “An area covering a radius of one kilometer is cordoned off for landing and take-off of the plane. It roughly comes to 750 acres. And this is to happen at 22 water bodies preventing the fisher folk from fishing,” adds the former MP. It is pointed out that the Environmental Impact Assessment (EIA) for the project had not been done despite Ramsar sites being involved. The project report for the seaplane operations was prepared by Pawan Hans Helicopters Ltd, and they have merely reproduced portions pertaining to environment and pollution from a study done in the USA. The 75 decibel sound that is produced by the plane is comparable to the speed boat, claims the report. The report is silent about the effect if any on the fish in the vicinity. “It is not as if the plane is landing on the waterdrome,” says Dr D Sanjiv Ghosh, former Additional Director, Fisheries. “Just as an aircraft needs a runway, the seaplane too lands on water and takes off from water. It creates turbulence in the surrounding water and could scare off the fish from the area,” he adds. However Dr KR Manmadhan Nair, formerly the Principal Scientist at Central Marine Fisheries Research Institute (CMFRI), disagrees with this. “The sound produced above the surface of water hardly affects fish. It may scatter them for a while, but the habitats will not be abandoned ,” he says. “No scientific studies have been undertaken on the impacts and fall outs,” says NK Sasidharan Pillai, the president of the Kerala Sastra Sahitya Parishad (KSSP), a prominent organization of scientists, social workers, teachers etc. “Apart from that, serious thought must be given to whether such juvenile projects should be imposed on the people, in the name of promotion of tourism.’ About one crore people visit Kerala as tourists in an year, of which seven to eight lakh are foreigners. In what way can a plane carrying five tourists boost tourist activities, he asks. Moreover, a vast majority of tourists are budget tourists, who come to India and Kerala because the destinations here are cheaper compared to the international scene, and they can ill afford to pay 4000 rupees for a 10 or 15-minute air jaunt. They would most likely prefer a four-hour boat cruise through the scenic waterways. Equally objectionable is the tendency to convert public spaces into private enclaves. These water dromes and the surrounding areas go out of bounds for the fishermen, lime shell collectors and the local inhabitants. Most of the backwaters and lagoons in Kerala have been encroached upon, the state government being the main culprit. Large tracts of water are reclaimed, mainly for building resorts and hotels with water frontage. Constructing water dromes and cordoning off the area amounts to the same. The local people have little or no say in these matters. It is to be noted that similar projects faced the wrath of the fishing community and local inhabitants in other countries. In Sri Lanka a seaplane project in the Negombo lagoon was abandoned in 2011 and agitation has started against such a project in Mountshannon in Ireland some days ago. A seaplane project for promotion of tourism, tried to be implemented in Negombo lagoon in Sri Lanka was abandoned in 2011 due to stiff resistance from fisherfolk and local people, despite its patron being the defence minister Gotabaya Rajapaksha, the younger brother of the Sri Lankan president. “Tourism can be a very good thing for Sri Lanka. 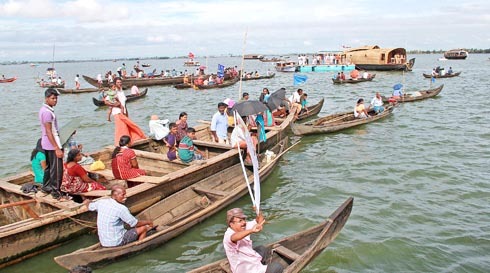 But the authorities need to consult local people before giving a go-ahead to projects like this one.” This was one of the main rallying points of the National Fisheries Solidarity Movement (NAFSO), which spearheaded the agitation. The turbulence caused when the plane lands, ban on fishing in the area when the plane lands or takes off, high noise levels and dredging were some of the adverse features highlighted. The project was to be implemented in 12 lakes. The Clare Champion, a periodical published from Ireland, reports on the opposition raised to the seaplane project in Mountshannon in June 2013. The reasons highlighted are same or similar to those raised in Sri Lanka and now in Kerala. Seaplanes which were introduced during the Second World War are now generally used for rescue operations and for emergency transport in archipelagos. These amphibian crafts are rarely used in inland lakes. Nearly 50 per cent of all seaplanes in operation are in the USA and they are governed by stringent conditions. The District Engineer has to make an environmental impact assessment before any seaplane project is sanctioned: in making his investigation, examination and determination, he has to consider environmental factors in accordance with the National Environmental Policy Act of 1969 (NEPA) and in particular, he should consider the impact that seaplane operations may have on the safety of the project, acquatic, fish and wildlife, noise level, recreation, air and water quality. Ironically, in Kerala, the government which ought to come up with similar guidelines, goes recklessly ahead making investments and creating issues where there were none, all in the name of earning foreign exchange which anyway seeps out fast. While the latest on the subject is that the government has decided to hold talks with the representatives of the fisher folks, one waits to see what comes out of it. In the meantime, just visualize the scenario when four other operators apart from Kairali Aviation, who have also registered, join the fray. Each will have to make several trips a day to make it financially viable. So you have any number of amphibians taking off and landing at 22 water dromes and flying at a height of 6000 feet through the state, through the day. Recipe for chaos. P N Venugopal is an independent journalist with The Quest Features and Footage, Kochi.